The North African campaign was one of the hardest fought episodes of the Second World War, yet the vital part played by the Italian Army - and in particular, its Folgore Parachute Division on behalf of the Axis Alliance - is frequently overlooked. Initially created to emulate the German Fallschirmjäger in order to carry out the planned airborne attack against the British base of Malta, Folgore Airborne Division fought on the battlefields of North Africa - including the key Battle of El Alamein. This elite unit distinguished itself at El Alamein despite inadequate equipment and weapons while facing unfavorable odds. 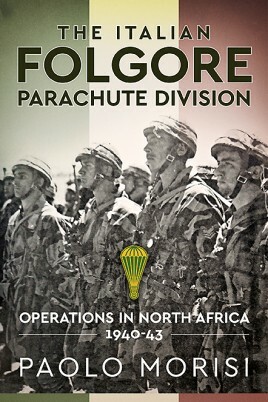 This book describes a paratroop unit that earned the respect of its Allied opponents during some of the hardest-fought engagements of North Africa. The key theme of the book is the paratroopers’ involvement in the Axis war effort through an analysis of their training, weaponry and battle tactics. Another key focus is an assessment of the Folgore's specific role during the major battles of the North African campaign. It covers in detail, for example, the Folgore's first fierce military engagement against British and New Zealand troops during the Battle of Alam El Halfa in September 1942. It then details a number of smaller actions that preceded the Battle of El Alamein such as the counter-attack during the British 'Operation Beresford', which led to the capture of Brigadier General G.H. Clifton, commander of the New Zealand 6th Brigade, by a patrol of Folgore soldiers. The focus then shifts upon the Folgore’s major engagement of the campaign during the Battle of El Alamein: 'Operation Lightfoot', which was launched by General Montgomery on 24 October 1942. It was designed to break through the Italian-held southern sector of the El Alamein line, where the Bologna, Brescia, Pavia and Folgore Divisions anchored the Axis right flank. While describing key events during this operation, the book also highlights how the Folgore used unusual tactics to repulse the massive enemy-armored attack. This included letting the enemy advance into a 'cul-de-sac' and then launching a counter-attack against its armored vehicles and infantry units from all sides and by a combination of fire from 47 mm anti-tank guns, mortars, hand grenades and other incendiary devices. It describes the desperate retreat in the desert of the Italian units as a result of the collapse of Axis military defenses in November 1942. Finally, it highlights the role of the paratroopers during the last battles in Tunisia - especially those in defense of the Mareth line and Takrouna in the spring of 1943. Illustrated with rare archival photographs, detailed maps and specially commissioned artwork, this volume offers a fascinating insight into a little-studied aspect of Axis forces. The volume draws heavily upon both Axis and Allied (Britain and New Zealand) archival sources such as the war diaries and the post-battle reports of the military units engaged in North Africa. It thus sheds new light into one of the most important campaigns of the Second World War. By drawing from archival sources from both sides, it also furnishes a more complete and balanced perspective on a critical juncture in the war such as the Battle of El Alamein. Since the early 1990s, Paolo Morisi has dedicated himself to academic and military studies research and has published books, articles and book reviews on European and military history. He has published several journal articles and reviews in peer-reviewed academic journals such as Modern Italy, Political Studies Review, Michigan War Studies Review, Telosand the Journal of Southern Europe and the Balkans. He has also received an award for his latest book publication that traces the history of Italian crack mountain storm-troopers of the First World War, entitled Fiamme Verdi (Bassano del Grappa, Itinera Progetti Editore, 2012). He is currently working on a comparative analysis of the Austro-Hungarian Sturmtruppen and the Italian arditi during the First World War for Helion & Company. He holds a Bachelor’s Degree in History/Politics from the University of Bologna, Italy and a Master of Arts Degree in Political Studies from Columbia University, New York City. "...a fresh, rare account of an Italian division in training and combat. Beyond that, the special nature of the para division and its bloody destruction at Alamein will be of interest to many readers."